Malcesine is an attractive resort on the eastern shore of Lake Garda between Torbole and Garda. There is an old town which is situated around the castle on the headland and the settlement spreads back into the fields and hills behind on the other side of the main road which gives access to the other resorts on the lake. 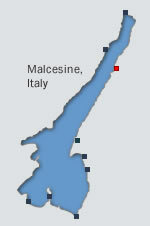 Many of Malcesine's hotels are located around and just behind the harbour and near the ferry embarkation point. Other hotels are available along the main eastern lakeshore road running north and south of the town. Looking for some of the best-rated accommodation in Malcesine?